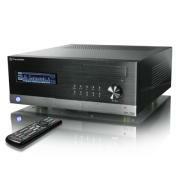 Recently the crave for Home Theatre PCs (HTPC) has been becoming more popular. Today we are going to take a look at the Thermaltake DH-101 Home Theatre PC Case. Thermaltake has rolled together a series of features and have put them all into this one stunning case. With a nice brushed aluminum front and a black piano finish, the Thermaltake DH-101 is bound to be an eye-catcher. Thermaltake has introduced the new digital Home Theater PC Chassis, the DH (Digital Home) series. Designed with the latest multimedia module and high quality piano mirror coating front panel, the new Digital Home series shines with elegance and charm! DH101 was designed with the latest LCD Display that not only supports multiple languages, but also allows different display selections with its blue glowing background. DH101 not only comes with high quality external design, but the internal structure and thermal modules further overturned the common impression of limited spacing and ineffective thermal solutions towards home theater PC chassis. The 12cm front fan and the double 6cm rear fan included in the unit saves the chassis from heating concerns. Up to three 3.5” and one 5.25” drive bays is also available for upgrading. The single insert/exit button on the front panel makes disc changing easy for users. DH Series HTPCs are the high quality chassis with delicate body structure and thoughtful internal space designs. The high performance thermal management and multifunction supports of DH 101 Home Theater PC Chassis will definitely be the best choice to build your own digital living environment, with high-tech fashion and aesthetic elegance.